The last two major lobes or parts of the brain, are the brainstem and cerebellum. While not necessarily considered lobes, they are typically thought of in the same conversation as they are large and significant structures. Shown above is the Brainstem, which includes the Pons, the Midbrain and Medulla Oblongata. 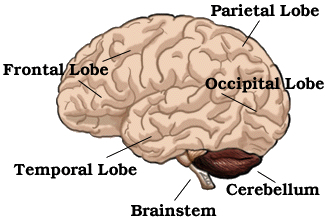 The brainstem is in the lower part of the brain, and includes the Midbrain, Pons and Medulla Oblongata. See image to the right. The Midbrain is also called the mesencephalon. The midbrain is the uppermost part of the brainstem. It is the part that is closest to the cerebral cortex, if following the run of the axons which connect the cortex to the body. The midbrain is divided into an anterior and a posterior section, which connect the third and fourth ventricles. Motor tracts (those which control the muscles) pass downward along the midbrain’s anterior surface. Sensory axons (those which perceive touch and other senses) pass along the front of the midbrain behind the motor tracts. The Pons, which is also part of the brain stem, is below the Midbrain and above the Medulla Oblongata. Motor and sensory tracts run along the front surface of the pons. The sensory axons are located behind the motor axons. The cell bodies of cranial nerves V and VI are located in the pons. Cranial Nerve V, or the trigeminal nerve, sends motor signals to the jaw and receives sensory messages from the teeth, tongue, and parts of the face. Cranial Nerve VI or the abducens nerve, provides motor instructions to the eye. The motor nucleus of cranial nerve VII, the facial nerve, is on the border of the Pons and Medulla Oblongata. The upper part of the nerve controls the muscles which control facial expression including the eye lids, forehead and the lips. The lower part of the nerve controls the voluntary muscles of the face below the eyelids. The Medulla Oblongata is in the lowest part of the brain stem. The cell nucleus or soma of several cranial nerves are found there. The cerebellum is the largest part of the hindbrain (the structures behind the cerebral hemispheres.) It is the dark brown area on the right hand diagram. It is behind the Pons and the Medulla Oblongata. 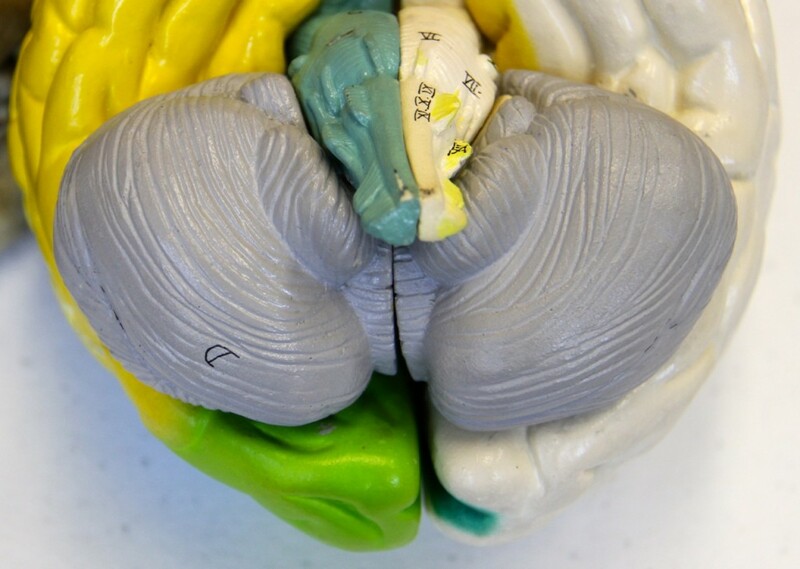 Unlike the other lobes, it is a distinctly separate structure as can be seen on the photographs of a hard foam rubber model of the brain below. The entirety of the cerebellum is detachable from the cerebral cortex in most brain models. It receives information from the sensory systems and the cerebral cortex. It controls muscle reaction in relation to equilibrium, movement and postures. It is also controls coordinated movements. The surface of the cerebellum contains far more sulci and furrows than the cerebral cortex. Shown is the Cerebellum, in gray, marked area D. The far closer together gyri and sulci in the cerebellum versus the other lobes is clearly shown here. The Brainstem is the projection just above the cerebellum. A profile of the cerebellum is shown here. Notice how separate and distinct it is from the other lobes.